Olcott was an American actor, singer and songwriter of Irish descent. Olcott was born on July 21, 1858 in Buffalo, New York. His mother was a native of County Cork, Ireland. My Wild Irish Rose was written in 1898. “Five years ago when Mr. Olcott and his mother were in Ireland spending the vacation months, they were sailing on a pretty Irish lake. The mother spied some beautiful flowers. She asked the boatman what they were. He told her they were wild Irish roses. “What a pretty name for a song,” she said. Other Olcott songs that also appeared in his musicals and became popular are When Irish Eyes Are Smiling, Mother Machree, and Too Ra Loo Ra Loo Ral (Irish Lullaby). 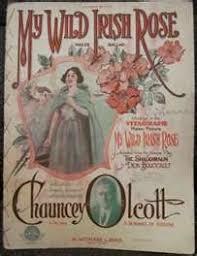 A 1922 silent film was titled My Wild Irish Rose, but not based on Olcott’s play. 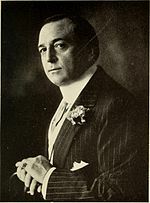 Olcott died on March 18, 1932 in Monte Carlo, Monaco. 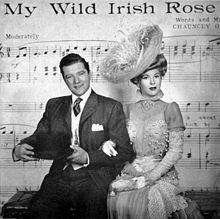 The 1947 film My Wild Irish Rose is a biography of Olcott. The film was based on the 1939 biography, Song in His Heart, written by his widow, Rita Olcott. In 1970, Olcott was posthumously inducted into the Songwriters Hall of Fame.